Nigel Bradham evidently had a cast on his thumb during the Giants game, and we all missed it. Oops. 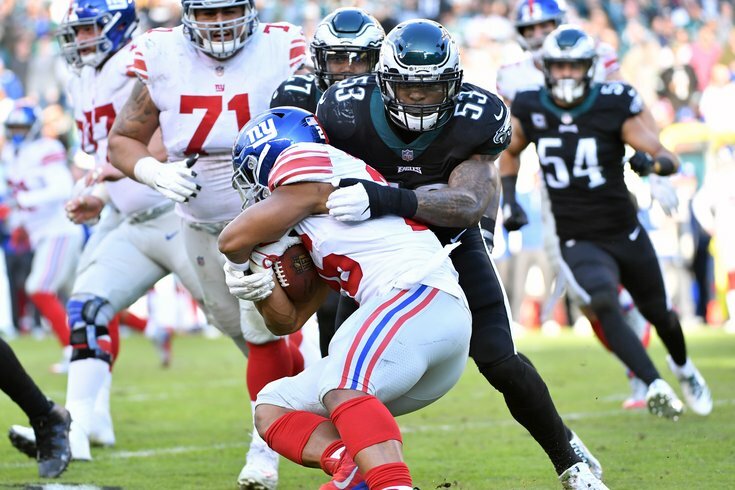 Philadelphia Eagles linebacker Nigel Bradham had surgery on his thumb on Monday to repair his thumb, which he broke in three places on the third play of the game against the New York Giants on Sunday. Somehow, he didn't miss any snaps. Bradham is the second linebacker this season to have thumb surgery, as Kamu Grugier-Hill broke his during the Eagles' game in London against the Jacksonville Jaguars. Like Grugier-Hill, Bradham is not expected to miss any time. "I think our medical people expect Nigel to play," linebackers coach Ken Flajole said. "It's probably comparable to what Kamu Grugier-Hill did to his thumb a few weeks back. Getting over the initial pain, I think they cast it, and they find a way to protect it so that he can play. Unless I get a different report, my expectation is that he will play." If you're wondering if it's difficult to play without a thumb, it is, Bradham confirmed. "It's tough just trying to get off blocks, being able to tackle," Bradham said. "You're pretty much using your hands on every play." "It gets tough, particularly on tackles, it's hard to grab and wrap up," he said. "You probably saw in the Dallas game Kamu had a chance for an interception. I'd think with two good hands and not one casted that maybe he would make that play." Bradham has not had his best year with the Eagles in 2018. On the season, he has 63 tackles (3 for loss), 2 sacks, and no INTs or forced fumbles. He wasn't delusional when asked how this season has gone. "Not great, obviously," he acknowledged. "Definitely not where we want to be as a team. Individually, obviously not where I want to be." While it's true that Bradham hasn't had his best year, his toughness should never be in question. "He is very tough, and he's been so durable for us for three years," Flajole said. "I just look at all the injuries that happen at other positions and stuff, and the fact that for us Nigel has been the one constant that has not really had any downtime for us, even though he's probably had some injuries where he could have come out. I remember in the Carolina ballgame a year ago, he got a shoulder stinger, and came out of the ballgame. I wasn't sure how long we were going to lose him for, he goes into the medical tent, comes back out, and he's back out on the field playing again. "He's a tough nut and that's one of the things I really respect and appreciate about the guy."